Sadly, up until recently, my daughter’s geekdom had a massive gap. Although a big fan of all things Monty Python, she had not seen Monty Python and The Holy Grail yet. Aside: For a change, I like the German title of the film much better. It is called Die Ritter der Kokosnuss (The Knights of the Coconut). This deplorable lack of education had to be rectified. After all I don’t want her French cousins to taunt her on her parents’ negligence – go to 1.48 and you know what I mean. As we were watching this highlight of visual art, my thoughts wandered to the other cinematic representation of the middle ages that I had recently watched. Look, feel, setting, cinematography were strangely familiar. And suddenly it came to me – was The Holy Grail the blueprint for Pilgrimage? 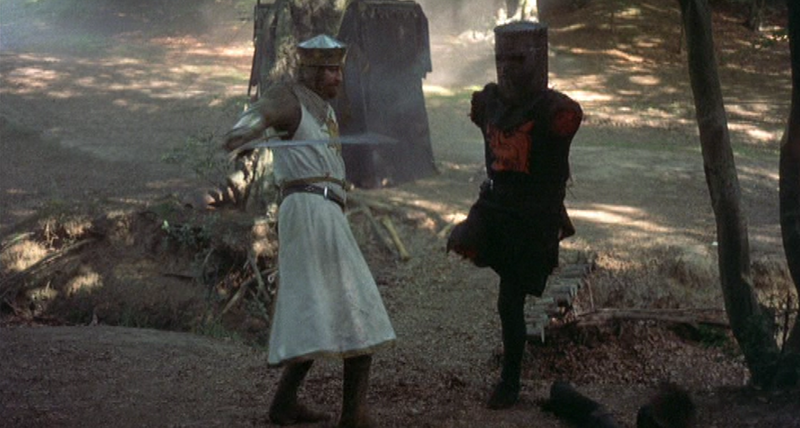 The gory, violent fight scenes in the latter – straight taken from The Holy Grail. Gorillas Knights appearing out of the mist. There we have it. Brendan Muldowney’s bow to Monty Python. If I recall, Richard said he had a huge hand in the look of his character. 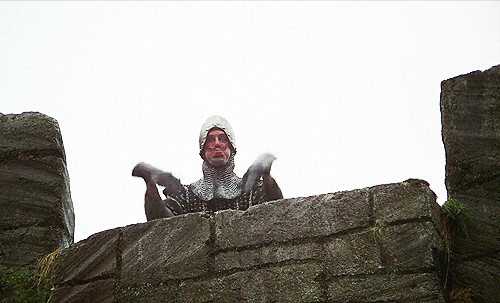 Obviously, Richard IS a Monty Python fan! LOL! I think this movie needs revisited. It’s been a long long long time and I don’t think my son has seen it. Time to rectify HIS education!!!! Oh, *did* he? 😳 Well, maybe he researched The Holy Grail for inspiration 😂. Maybe we’ll do it this weekend. School starts for real on Thursday, I have open house tomorrow and I’ve not done squat on my room. Although very few come to it on open house. Hoping we’ll be given enough time to actually do some work! Maybe it’ll be the reward for getting everything else done! That hairstyle must have really tickled their fancy since they gave it to Sir R’s horse as well. IMHO they went one better than Monty Python with the mist scene. Theirs had pixie ears. I can always use a good Monday morning laugh. The hair! Thanks. 😂😂😂 Oh dear, I’ll never be able to see Sir Raymond in the same way again! LOL. This is really important education. And Monty Python is probably even more popular in Germany than it is in the English-speaking world. Yep, priorities. I have been using Monty Python to explain post-modern art to my kids. Love that movie and all things python. I don’t mind if it creeps into my mind during Pilgrimage. Although people might hear a snort or two at inappropriate moments or think I’m choking on my popcorn. Love it! Great comparisons! You’re on to something! Hehe, particularly the hairstyling is a convincing argument, isn’t it? So funny! I love the hair comparison, particularly! Hehe, it hit me with a sledgehammer when I saw the film… Just goes to show that a handsome man can not be disfigured. Ahem. What’s next in her education? Life of Brian? It’s my fave Python film. Can’t think of comparing it to anything RA has done, though….